This article extends the information contained in the article, In Space, No One Can See The Stars. It points out how the magnetosphere, as well and the atmosphere, interferes with the passage of light, transforming it from its metaphysical, invisible state to a physically visible state. In its free-traveling state, light is composed of three energy charges – electric, magnetic, and etheric. The nonphysical etheric energy encases the other components, making the light invisible to physical eyes. When a particle of light hits a barrier, or is interfered with to the extent that it changes course, it loses its etheric charge. The Earth’s atmosphere diffracts light, making it change course, as does its magnetosphere. The Earth’s magnetosphere is a zone of magnetic energy which extends for many thousands of miles into space and is blown along by the electrically-charged solar wind. Magnetic energy and etheric energy interact with each other as do magnetic energy and electric energy. In cosmology, the reason that “dark energy” (etheric energy) and “dark matter” (etheric matter) are known phenomena is because of their interaction with gravitational fields. 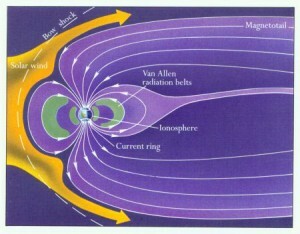 Like the atmosphere, the magnetosphere interferes with light enough to make it become visible. 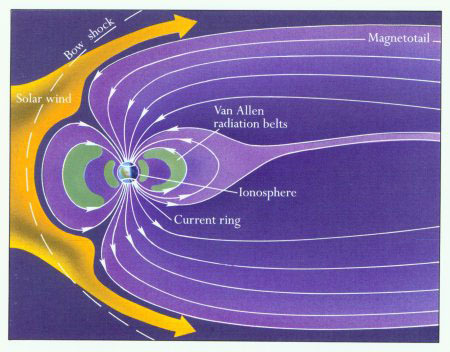 The variable direction of the magnetospheric wind accounts for astronauts having seen stars only sometimes. Neil Armstrong, on his way to being the first person to walk on the moon, reported that he could not see the stars while on the way to the moon. His Apollo 11 flight was launched shortly after a new moon. Had they flown toward a full moon, they would have been enveloped in the downwind side of the magnetospheric wind as the Sun blew it from the Earth in the direction of the moon. As it was, they could only detect stars through the telescope-equipped navigation system – a device which does interfere with the passage of light enough for a navigation star to be detected. Curiously enough, his command module pilot later reported being able to see stars visibly once he was in a low altitude orbit around the moon, which would mean that the moon’s magnetosphere made such sightings possible. When light hits a barrier and is forced to change course, its non-physical etheric energy component carries on as if no barrier had been encountered, much like a ghost passing through a physical wall. The physical (electromagnetic) component of the light, now diverted onto a different path and free of its nonphysical shroud, becomes visible. The Dark Light Effect is that light – which consist of etheric, magnetic, and electric energies – travels through free space in an etherically-cloaked state until it encounters a reflective barrier or becomes encumbered by a physical or magnetic filter, at which point it becomes separated from its etheric component, becoming uncloaked and physically visible. This entry was posted in Metaphysics, Owen K Waters, Spiritual Dynamics on March 29, 2014 by Owen K Waters. Poverty can afflict spiritual seekers more than any other educated group of people because of past lives. Often in the past, a serious-minded spiritual seeker would incarnate for the purpose of exploring life as a monk or a nun. The vow of poverty that came with such a decision was no problem. At the time, it was a great idea. After all, they would be supported in their life of service by a monastery or nunnery. The problem is what happened later. You were born into this life with a full memory of all your past lives – and vows – tucked away in your subconscious mind. Those vows keep on affecting you. They keep on going and going like the batteries in the Energizer Bunny, molding the way your conscious mind sees life. So many of us have been monks or nuns in past lives, renounced money, and trained ourselves to think that money is a distraction from spiritual pursuits. Then, in this life, we wonder why money becomes such a focus, simply because there is never enough of it to pay the bills! In my case, I have spent this entire life as a dedicated spiritual seeker. I have experienced poverty and I have experienced prosperity. As a child, my family was so poor that I qualified for free meals at school. Shopping for fun never crossed our minds; we only replaced clothes and shoes when the old ones were well and truly worn out. Later, I decided to try affluence instead. Wow, what a difference! I lived in “Beverly Hills, 90210” before it ever became a TV show. I drove a brand-new luxury car that belonged to me, not the bank. I had no debts and enjoyed the good things in life to the fullest. In affluent neighborhoods, you sense a palpable aura of comfort that fills the air. Did all that detract from my spiritual pursuits? No way! I learned more new things about spirituality at that time in my life than I ever had before. The monk thing didn’t get in my way because I’ve never done a vow of poverty in any past life. I was a monk once, back when the Buddha was alive, but that was at a time when the whole poverty vow idea hadn’t been invented yet. So, unencumbered by a vow of poverty that can haunt a person’s subconscious mind, I showed that a person can be poor or prosperous – either way, there’s no barrier – it’s simply a choice. Now, if you have been haunted by the conviction that poverty is next to saintliness and find yourself continually struggling to pay the bills, what choice do you have? Well, you can dig up that old vow of poverty and consciously release yourself from it, even if you don’t remember the past life details about how and when it happened. Poverty used to allow monks and nuns to focus on serving their institution. In today’s commercial world, however, it causes severe, life-choking limitation. If you harbor the hidden belief that your bank account should be perpetually empty, then letting go of that unconscious, contracting belief in poverty will open up huge doors of personal freedom. In today’s world, especially when you are retired, you can only pursue your greatest joys if you have the necessary resources. Travel, study, adventures and hobbies all take funds. At one time, a vow of poverty let you focus on your purpose. Today, however, it makes you miss out on many of the potentially fun experiences and consciousness-expanding opportunities in life. I am about to give you a way to release any vow of poverty that may be residing in your subconscious mind. Once you have released such a barrier to your own natural abundance, here is how you can create a new life of freedom from financial limitation. Thoughts are creative. When you focus an intention, the nature of the universe is to mold itself into that intention. The universe is abundant. If you think you have lack, the universe will create the perception of lack; then your life will be abundantly filled with lack. Of course, prosperity doesn’t just materialize because you wish it to be so. Intention alone won’t do the trick. The Law of Creation has three parts: Intention, Feeling, and an essential third component – Action. What action is needed? Increase the value of your service to society. Observe what people need and help them connect with it. Once you release any subconscious vows that no longer serve you, it feels perfectly fine to accept a financial exchange of energy for services rendered. Now, you’ve probably heard that the love of money detracts from spiritual pursuits, and so it does. But let’s get it right. It’s the LOVE of money that’s the issue, not the money itself or the natural expectation that you will be fairly paid for your services. After all, money is the way we share our labors in this complex modern world. We are no longer in the agricultural age, trading potatoes for milk or clothes or wood. We specialize in our work and we use the form of energy called money as a medium of exchange for an endless variety of the results of other people’s specialties. If you don’t enjoy the full freedom of the financial abundance that you deserve as a spiritual person, do the following release exercise. The result can be like the difference between night and day. The next day, if you find yourself haunted by any nagging doubts about whether you deserve your full worth as a spiritual human being who is bettering the world, repeat the process. If necessary, keep repeating for as long as it takes. The world is waiting for you to rise to the place where you will realize your life’s full potential. This entry was posted in Metaphysics, Spiritual Dynamics, Spiritual Growth on March 15, 2014 by Owen K Waters. By looking at Creation from the top down, this article will even provide the answer to two of the most vexing mysteries in the science of physics today: How is light transmitted and what is the nature of gravity? Creation was achieved by separating Original Consciousness into two distinct aspects – Pure Thought and Pure Love, then setting them into complementary motion. It is the Pure Love aspect that is compressed into this physical realm as the field which forms the very fabric of space. Until a century ago, the idea of an all-pervasive field was generally accepted by science. It was considered to be a light-carrying medium and was called the aether, right up until the time that it was abandoned because of a misunderstood experiment. Consider this: Common sense says that light must be carried by some kind of medium. After all, sound waves are carried through the air and water waves are carried through bodies of water. There is always a medium that carries any type of energy wave. Light waves are vibrations in a medium of some kind, so what is waving? Currently, science is unable to answer that question in any way that satisfies common sense. The Michelson-Morley experiment of 1887 was the turning point in scientific opinion about the aether. This experiment assumed that, if the Earth moves through a solar system filled with a static aether field, then the speed of the Earth’s orbital travel must affect the speed of light on Earth. 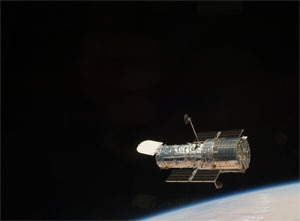 If you shine a beam in the direction of orbital travel, it should have a different speed when compared with a beam shone sideways to the direction of travel, as one beam gains some benefit from the speed of the Earth while the other does not. As no difference was detected, it was assumed that no aether field exists. The fatal flaw in the experiment is that it makes the assumption that the Earth moves through a static aether field in space, but what if a huge physical body like the Earth carries its own aether field with it? It’s not hard to imagine an aetheric aura around the body of Earth just like the aura that exists around your body. If you operate this experiment inside an aetheric field that travels with the Earth, then any motion through the aether will not be apparent because its field is traveling with you. Today, having abandoned the aether concept, science postulates that space is filled with a vacuum. By definition, a vacuum is nothing, so it cannot be a medium for the propagation of something, so that idea does nothing to fill the gaping hole which has appeared in the science of physics. Meanwhile, God’s big hint about the exact nature of the aether field has been jutting out in plain view for well over a century. In 1862, Maxwell discovered that light is electromagnetic in nature. We have since found that electrons and photons of light are remarkably interchangeable. So, if light waves are electric-like waves traveling through space, then from where does the magnetic part of an electromagnetic wave come? Obviously, it is the magnetic nature of the aether – the fabric of space – that provides the complementary magnetic waves that make up electromagnetic light waves. A word of caution here: The word aether, or its modern spelling ether, causes a lot of confusion because it sounds very much like the term etheric energy, which is a different energy entirely. Etheric or vital life energy is used in healing work and we will be writing extensively on ways to gain enhanced wellness from this life-giving energy. What can we do to distinguish between the ether as the fabric of space and etheric energy as the vital life energy used by healers? Bring God into the picture! The best name for the all-pervasive field of Divine love energy that fills our universe is, of course, the God field! This entry was posted in Metaphysics, Spiritual Dynamics on March 8, 2014 by Owen K Waters.